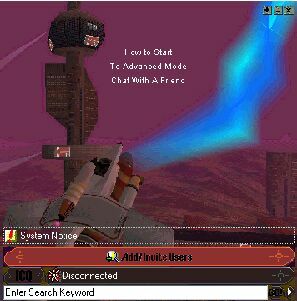 We all have Jim Kluza to thank for creating the above Hardwar themed skin for ICQ. You can download this skin here. This zip file includes instructions, the theme, and a shortcut to ICQ Plus. You'll need the free ICQ Plus to apply the theme. You can get the ICQ messaging program at http://www.icq.com/ . ICQ Plus that applies the skins is found at http://www.icqplus.org/ .